On 13 January 2008, a unique event in maritime history took place when Cunard's three magnificent Queens met in New York Harbor for the first and last time. The legendary Queen Elizabeth 2 led the regal procession under the Verrazano Bridge during her final world cruise. QE2 had also just enjoyed a combined transatlantic crossing with her brand new fleetmate, Queen Victoria, on the first leg of her own maiden world cruise. As the pair approached the entrance to the Hudson, they were joined by the mighty Cunard flagship, Queen Mary 2, to make a grand entrance the likes of which Lady Liberty will never see again. In life, the majestic trio arrived and left in darkness. 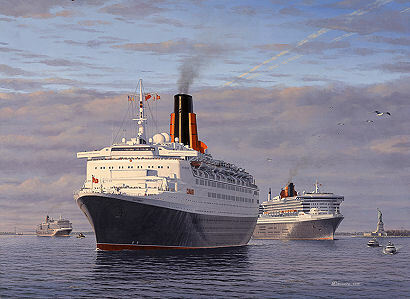 Artist Gordon Bauwens, whose work hangs aboard all three Cunard Queens, was commissioned to portray the event as many would have preferred, with the liners dramatically bathed in early morning sun. The original painting was commissioned by fellow shiplover and author Martin J Craven for the cover of his forthcoming book. The image is also reproduced as highly detailed art prints to enable like-minded enthusiasts to live forever the day three Queens came sailing in. These 650 Limited Edition high quality litho prints, entitled The Grandeur of the Queens, are produced on 300-gramme pH-balanced art paper using light-resistant inks. Each is Artist-signed and numbered and comes with matching Certificate of Authenticity. This painting is the 11th featuring Queen Elizabeth 2 by Gordon Bauwens. His maritime art career began with QE2's launch and has been greatly influenced by this beautiful ship, the last in a long line of over 100 Clyde-built Cunarders. This legendary liner is greatly missed by ship lovers everywhere, and none more so than by Gordon Bauwens. Of QE2, he wrote, "Farewell Friend. Out of sight, but in our hearts forever..."
From a commissioned oil painting by Gordon Bauwens showing Cunard's three Queens meeting in New York for first and last time, 13 Jan 2008. Limited edition of 650 litho prints, 50 Artist Proofs each Artist-signed.